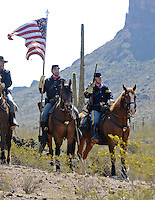 The BATTLE of PICACHO PEAK had its 150th Anniversary in March and attracted record crowds to that special day held at Picacho Peak State Park where the most westernmost battle fought in the Civil War occurred. The Civil War in the South West re-enacted the Battle of Valverde NM and the Battle of Gloretta Pass New Mexico as well as the skirmish at Picacho Peak. welve Union cavalry troopers and one scout (reported to be mountain man Pauline Weaver but in reality Tucson resident John W. Jones), commanded by Lieutenant James Barrett of the 1st California Cavalry, were conducting a sweep of the Picacho Peak area, looking for Confederates reported to be nearby. The Arizona Confederates were commanded by Sergeant Henry Holmes. Barrett was under orders not to engage them, but to wait for the main column to come up. However, "Lt. Barrett acting alone rather than in concert, surprised the Rebels and should have captured them without firing a shot, if the thing had been conducted properly." Instead, in midafternoon the lieutenant "led his men into the thicket single file without dismounting them. The first fire from the enemy emptied four saddles, when the enemy retired farther into the dense thicket and had time to reload. ... Barrett followed them, calling on his men to follow him." Three of the Confederates surrendered. Barrett secured one of the prisoners and had just remounted his horse when a bullet struck him in the neck, killing him. Fierce and confused fighting continued among the mesquite and arroyos for 90 minutes, with two more Union fatalities and three troopers wounded. Exhausted and leaderless, the Californians broke off the fight and the Arizona Rangers, minus three who surrendered, mounted and carried warning of the approaching Union army to Tucson. Barrett's disobedience of orders had cost him his life and lost any chance of a Union surprise attack on Tucson.